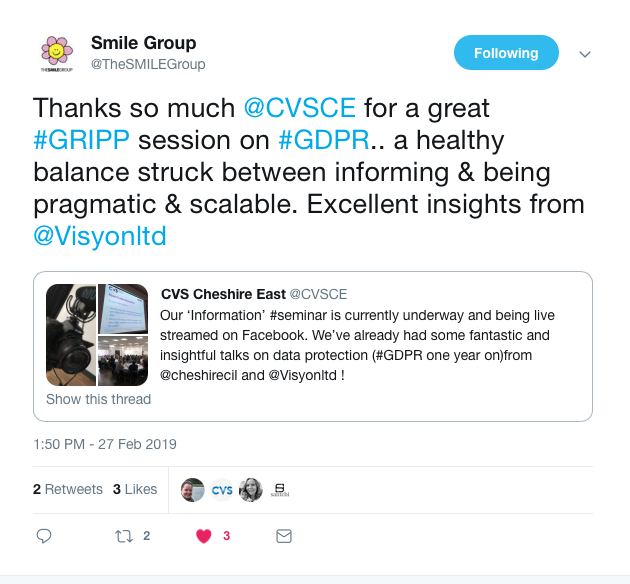 The CVS GRIPP Digital Spotlight Seminar Series comprises of 5 individual seminars focusing on the 5 key areas CVS use to assess organisations as part of GRIPP Assurance, with a spotlight on the digital tools, resources and workflows available to support organisations in these areas. The series will close on 3 webinars on (TBA) subjects raised by the discussions and feedback from the seminars. All the GRIPP Digital Spotlight Seminars will also be live streamed via Facebook Live. Those watching live can participate in Q&As via the Facebook Live Chat feature. A member of the CVS team will be hosting the Facebook Chat and verbalising your questions during the relevant segments. You can join the stream later and rewind to any previous point. The full video will be available to view on our Facebook page and website shortly after the end of the stream to watch at your leisure, along with any recourses made available during the seminar. It is worth noting there is a broadcast delay when it comes to live streaming, this could be between 10-30 secs dependant on your hardware and Internet connection, This may result in any comment and questions you post not being picked up on immediately. Be sure to follow us over at Facebook (https://www.facebook.com/CVSCheshireE) to receive invites and notifications to the stream. The recordings will also be made available here on our site after each event. The fourth in our GRIPP Digital Spotlight series, this seminar focused on the PROJECTS element of GRIPP. This talk showcased a new digital data monitoring tool called Tableau. Tableau is a business intelligence software that helps people see and understand their data. This talk included a demonstration on how the tool works, how the data can be used internally and how you can use your data as a promotional tool with its data visualisation features. many different methods of evidencing needs for projects. Ann Wright from Just Drop In in Macclesfield and Matt Williamson from Wilmslow Youth shared how they include service users and stakeholders when gathering evidence of need for projects, and in creating effective and rounded bids. The third in our GRIPP Digital Spotlight series, this seminar focused on the INFORMATION element of GRIPP. 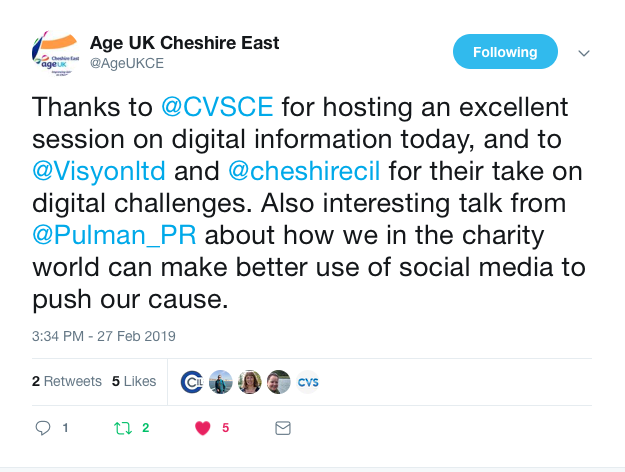 This was then followed by a brief session led by CCIL about digital tools that can help you share your message with those whose needs may require extra consideration. Funding Toolkit 'Broaden your Funding Streams': Don't be reliant on grants. Find out ways you can diversify your sources of income! Lisa started work at East Cheshire Hospice back in 2012 in the kitchen. After enjoying meeting the patients and families and understanding the amazing work of the Hospice, Lisa’s career progressed into working in the volunteer services team which then lead to the fundraising team. Now working as the Community Fundraiser, Lisa has been in the fundraising team for over three years of building a relationship with new and existing fundraisers to raise £500k for East Cheshire Hospice. Building relationships with the team of 600 volunteers have enhanced Lisa’s work within the fundraising team, which will be one of the main areas of discussion; People, People, People! Top tips for digital fundraising: Find out how to make the most of online giving and mobile phone giving! The first in a series of CVS seminars covering Governance, Resources, Infomation, People and Projects. The seminar featured speakers on two topics Risk Management and DBS checks. Risk management will enable you to understand and explore what risk means for your organisation and consider what risks you should be monitoring. The DBS session will cover, should you as Trustees be DBS checked, when to check staff and volunteers and when and how you should make disclosures.